Located just one nautical mile from the town of Marathopoli in southwestern Messenia, Proti Island is a popular day trip destination for swimming, snorkeling, scuba diving, rock climbing, cliff jumping and trekking. 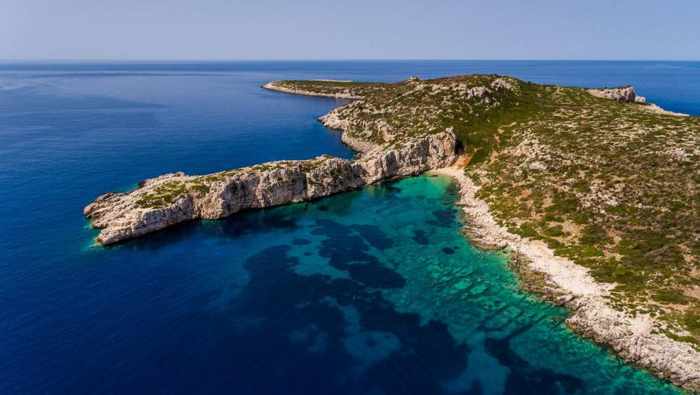 This aerial photo of Proti Island is from the website for the Artina hotels in Marathopoli. Lagouvardos, shown in this aerial video by Giannis Mpantes, is a long golden sand beach less than 3 kilometers from Marathopoli. It’s considered one of the top surfing spots in Greece, and also attracts enthusiasts of windsurfing, SUP, canoeing and other watersports. Surf’s up! 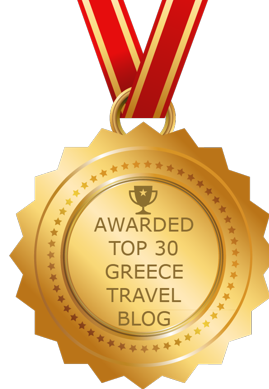 : In a recent post I noted that the quiet, laid-back town of Marathopoli is an ideal base for travellers wishing to explore Methoni, Pylos, Navarino, Voidokilia and other popular places in the Messenian region of the southwestern Peloponnese. Even closer to the town are two noteworthy destinations that draw active travellers seeking scenic spots for outdoor sports activities such as swimming, surfing, windsurfing, snorkeling, scuba diving, rock climbing, trekking and fishing. Uninhabited Proti Island, which dominates sea views from the town, is approximately one nautical mile away and can be accessed in summer on boat trips from Marathopoli harbour. 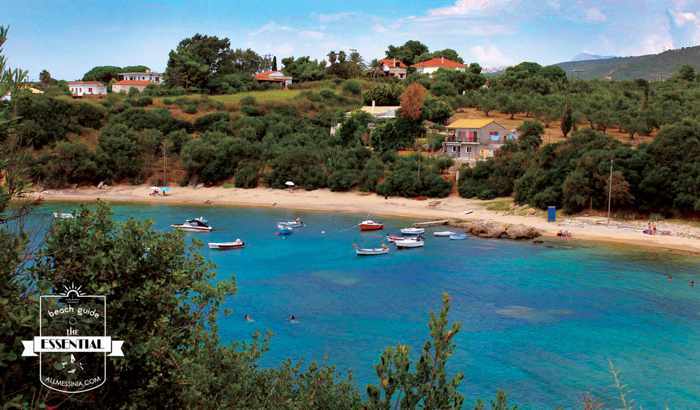 The tours take passengers to secluded coves, including Grammeno Bay, and stop at picturesque Vourlia beach for sunbathing, swimming, snorkeling or jumping into the sea from rocks and ledges along the rugged coast. The Monastery of the Assumption of Gorgopigi is one of the sights that hikers might encounter while walking some of the trails on Proti Island. This photo appears on the websites for Lagouvardos Apartments and other Marathopoli-area businesses. Trekkers can explore Proti Island on three designated hiking routes, while rock climbers can test their skills on the challenging cliffs and coastal rock formations. Fishing trips and sunset tours also are available. For those curious to see what lies beneath the waves, Ionian Dive Center offers scuba diving excursions to such island sites as the Anouar shipwreck in Vourlia Bay, the Tiganakia wall and cavern, the Blue Hole cavern with stalactites, Callens Valley and the Beacon Cove. Lagouvardos Beach is only 3 kilometers from Marathopoli so it can easily be reached by car, bicycle or even walking. The Culture Trip website has included Lagouvardos on its list of The Best Surfing Spots in Greece, while travel publications and online guides regularly recommend the beach for windsurfing, stand up paddle boarding (SUP), swimming, canoeing and other watersports. Equipment rentals and lessons are available from the Beach Break surf club at Lagouvardos. For beach lovers and watersports fans who don’t mind driving a little farther afield, some of Messenia’s most beautiful and world-famous beaches — including Vromoneri, Mati, Romanos, Golden Sands Divari, and the incomparable Voidokilia — are situated within a span of just 7 to 15 kilometers. 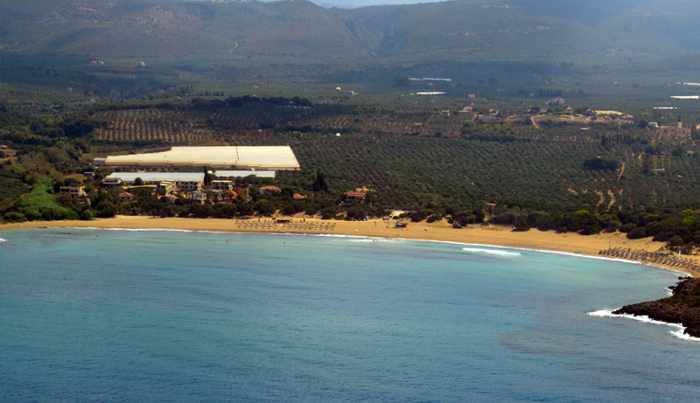 Additionally, the Marathopoli area is ideal for bicycling and mountain biking, while two globally renowned 18-hole courses at nearby Costa Navarino offer golfers the opportunity to tee off in spectacular settings. 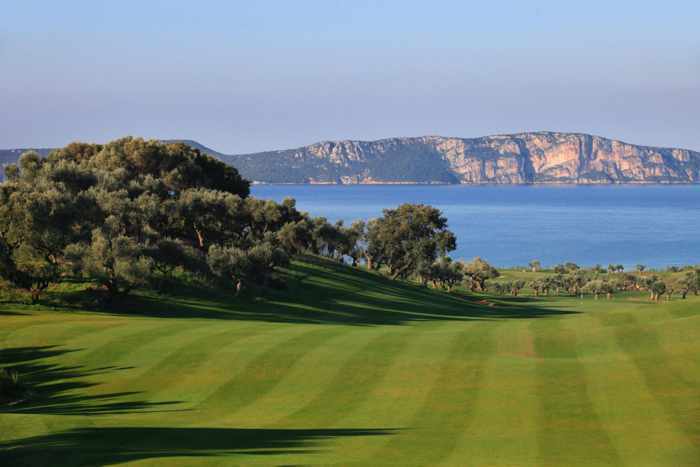 Award-winning world-class links await golf enthusiasts at Costa Navarino, just 13 km from Marathopoli. The green pictured above is on The Dunes Course, while the one below is on The Bay Course. Both images are from the Costa Navarino Facebook page. 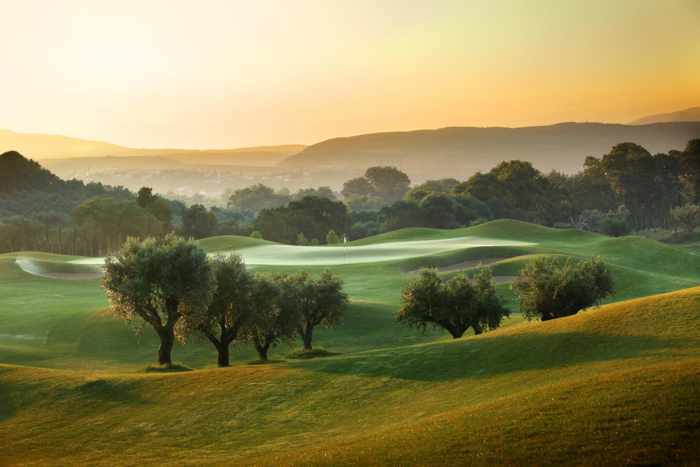 More stunning photos and extensive information about the two golf resorts can be found in the golf section of the Costa Navarino website.